To celebrate the 100th piece on my blog I have decided to write about an event that took place this weekend that is near and dear to my heart. 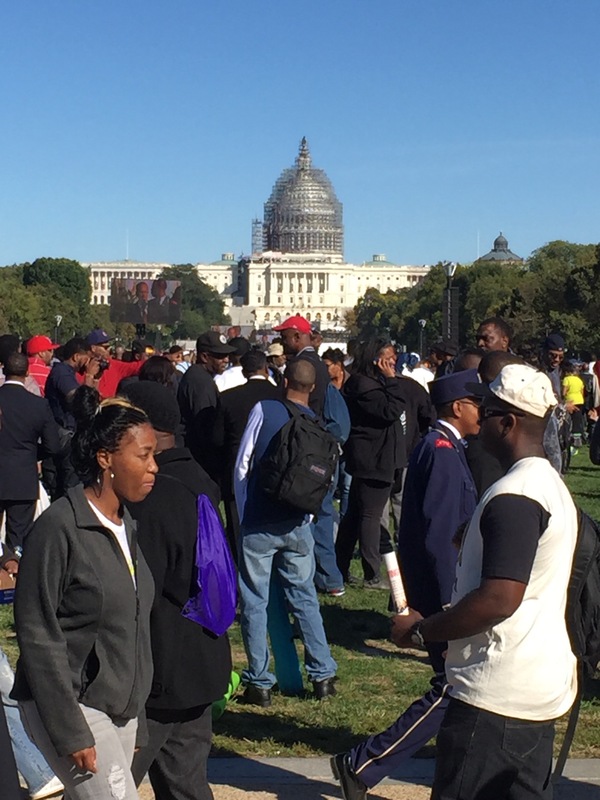 As many of you know this weekend was the 20th anniversary of “The Million Man March”. The slogan was “Justice or Else”. How that phrase rings true today more than ever. We all have watched the images on the news or through social media outlets of the injustice that has increased drastically over the years. Every other report shows an image of our people becoming a victim of senseless killing done mainly by police. It has become almost normal for us to see the headlines of my people losing their lives because of ignorance, stereotypes and hate. My purpose for being apart of this movement was simple: It can be me. This injustice is no longer a gender specific issue. African American men and women have been attacked and treated unfairly. This March was for my unborn children, for your children and for my students that I work with. This march was for all those who we have lost along the way. This march was for me to realize how much work needs to be done before we ever get to a place of peace. To see in the crowd all the brown faces that covered the National Mall area in DC was was truly epic. It was as if we all shared in this special language that was only understood by us. I just took my time and scanned the lawn looking at the expressions that were written on the faces of my people. Some were happy, many looked tired and in distress as if they were searching for answers to the problems which plagued our generation. 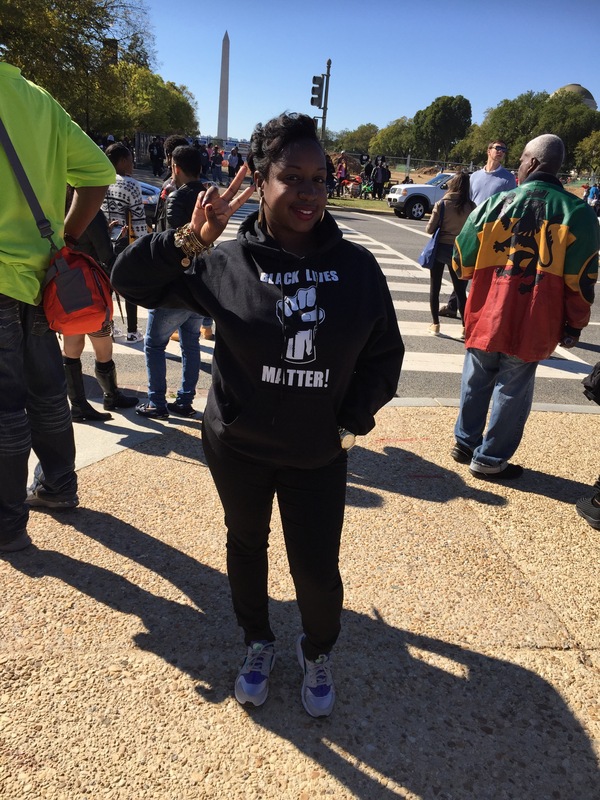 Families came out in droves bringing their little ones who wore shirts that read: “black lives matter” “hella black, hella proud” and “justice or else” just to name a few. I wonder if they knew how important their existence is to this day. It was as if we all shared in this special language that was only understood by us. Do we know how important our existence is? What are we doing to make our voices be heard? What are we doing to change the way police and society view us? What is it about us that allows people to take their guns out, pull the trigger, aim and then shoot? Not once, but multiple times with no remorse? Why is that that our hooded sweatshirts triggers others to believe we are dangerous and a threat to the community? Why are we being pulled over randomly for no reason and then shoved into a jail and then days later found dead in our cells? These questions are the reason I had to be present for such an important time in our history. …With each candle lit, a lil bit of the darkness disappears …. Thank you for the feedback and such a powerful statement! Happy you went! Also praying for a world where there are good and bad people period! Waiting for the world to wake up and realize that those traits are not contingent upon race, but upon love or lack there of. 🙏🏾🙏🏾 In Jesus Name we pray!!!!! From your mouth to God’s ears! !